Boston and South Shore Attorney With 27 Years of Worker's Compensation and Social Security Disability Experience. Atty. Ladas worked many years as an insurance defense attorney. He now uses that experience to get you all the benefits you deserve. Our firm concentrates in social security disability law, workers' compensation law, motor vehicle accidents and all other matters of personal injury. In today's competitive legal environment, you must have an attorney who is experienced, knowledgeable, and capable. We work closely with our clients in order to gain a complete understanding of their goals and objectives. Whether you are seeking workers' compensation benefits or Social Security Disability Insurance benefits, or both, an experienced lawyer may make the difference between receiving the benefits you need or being denied. At Ladas Law Firm, P.C., we represent individuals who have been injured on the job and individuals disabled by illness or injury, and will help you through the complicated process of filing for and obtaining benefits. We offer a free initial consultation on matters concerning social security disability, workers' compensation, motor vehicle accidents, slip and falls and all other matters of personal injury. Legal Assistant, Deb & Office Manager, Patricia. The Ladas Law Firm has 25 years experience handling worker's compensation cases. We get our clients the best possible results. If you have a work related injury call us. We want to help you get the benefits you deserve. The Ladas Law Firm was started over 25 years ago by J. Stephen Ladas and his sister, Elizabeth Ladas Harrington. Prior to starting Ladas Law Firm Mr. Ladas was a defense lawyer working for the insurance industry. He uses many years of defense experience to now help injured workers get their benefits so they may continue to support their families while they treat for their injuries. If you've been injured at work call us. We want to help. Ladas Law Firm can handle all parts of your case, but if you only have the need for our services in one area we will be glad to help. We are always interested in making the cost of legal services affordable to our clients. Therefore, we do delegate less technical legal work to legal assistants, paralegals and associates. All our attorneys are experienced trial attorneys with proven track records. Whenever we can resolve a case in the best interests of the clients, we will use alternative dispute resolution. But, if a case needs to be tried in order to get the best results for a client we will use our years of experience to win. The insurance industry knows we have a proven track record and are prepared to try your case when they refuse to settle for a fair amount. During the course of the year, we represent pro bono clients on particular legal matters. Attorney Ladas volunteered many years as a planning board member for a local south shore town. Our lawyers have been practicing in the area of personal injury law with an emphasis on social security disability law, workers' compensation law, and motor vehicle accidents for over 25 years. Our partners have past experience working as defense attorneys in the insurance industry. Therefore, we have the benefit of a legal perspective which comes from experience in both working for and against the insurance industry. We are always prepared to try your case and never settle for less than what you deserve. At Ladas Law Firm we believe it's important that clients understand their case and therefore we both encourage them to educate themselves and we spend time teaching them about the particular law they are dealing with. But, it's important for them to know they should not take any action on their claim until they have consulted with an experienced lawyer. At Ladas Law Firm we believe it is our job to help educate clients in understanding this complicated legal society we live in. To that end, we gladly review any document our clients may need help with. Atty. J. Stephen Ladas has always had a desire to help people. Upon graduation from college he held his first job as a claims adjuster for a major insurance company. On many of the cases he handled people were not represented by a lawyer and did not understand what it meant to "settle". He wanted to help people know their rights and decided to return to school to pursue his law degree. When he graduated he decided to start Ladas Law Firm and help protect people who had been injured in accidents. 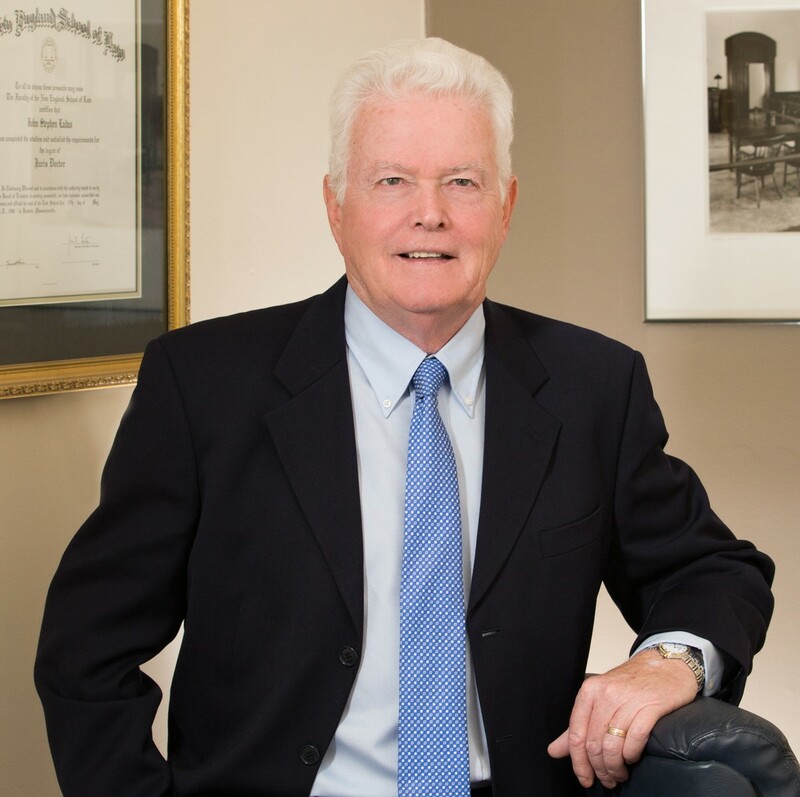 Ladas Law Firm, P.C., was started in 1989 by Attorney J. Stephen Ladas. Mr. Ladas is a graduate of The University of Massachusetts where he earned a degree in Political Science. After college he worked in the insurance industry. He later earned his Juris Doctorate degree at New England Law Boston. He served in the United States Army Reserves for six years with the 357th Civil Affairs Area B Headquarters. He is a member of the Massachusetts Bar and admitted to the U.S Appeals Court. He has lived on the South Shore all his life.